I have had a fascination with Bible prophecy since I was twelve, and have studied it immensely over the past 18 years (not in isolation, but through proven Bible prophecy scholars, such as Perry Stone, Bill Cloud, Rick Renner, Joel Richardson, Jonathan Cahn, Dwane Miller, Donald Perkins, Mark Casto, etc. ), as well as being involved in Perry Stone’s Mentoring Institute for Ministry from 2012-2013. Not all Christians are fascinated with biblical prophecy, and that is completely fine. Around 90% of Christians either do not care about it and/or simply do not understand the concept, patterns, and biblical cycles. Which is also completely okay! We need a diverse church in the sense that some teach the ‘common sense approach’ to God’s Word, some teach the linguistic (Hebrew/Greek) aspects of it, and some teach about Bible prophecy. We need a healthy dose of each. If we have all of one category, we are unbalanced. If we get so wrapped up in Bible prophecy, then we have a hard time relating to others what we are studying. If we only focus on the theological aspects of everything, such as Hebrew/Greek, then we will be filled with so much head-knowledge and can come off as out-of-touch to what people are struggling with in their own spiritual formation. If we only dig into the common sense application of the Word, then we miss out on digging deeper into expository studying of the Word. It’s amazing to see prophecies being fulfilled in our day. The Bible pinpoints 3 major events that must happen before Jesus Christ returns to the earth. We have 2 of the 3 fulfilled as of 2017: Israel has been restored, the gospel is present in every nation, though Jerusalem has not been recognized as Israel’s rightful capital city. If you look at the Jubilee cycle on the Jewish calendar (every 50 years), Israel and the Jewish people get a breakthrough – it’s amazing. (see Lev. 25:1-4; 8-10) Take a look at 1917. It’s the year the Balfour Declaration was issued by the British, enabling Jews to start returning to their homeland. Fast-forward exactly 50 years and you get to 1967. What happened in this year? The Six-Day War, in which Israel was invaded by Egypt, Syria, Jordan, and Iraq. Guess what? Israel won. No surprise there. And, Israel reclaimed the city of Jerusalem. 1967 was another Jubilee year for Israel. The Bible has a lot to say about leaders. For example, In Exodus 1, there was a Pharaoh who arose that “knew not Joseph,” meaning, he didn’t understand the covenant that the Hebrew people had with God as a nation. The modern-day type-and-shadow of this is President Obama. He is the only U.S. president who said he wanted to “fundamentally transform America,” given in a speech he made on February 19, 2008. This means that you go to the foundation and rip it away. What was our foundation? The Bible and Christian freedom. As a leader goes, so does the nation (not the other way around). Saul became King over Israel because God handed the people what they wanted, even though Israel did not need a king. In 2008 and 2012, the people of the U.S. got what they wanted. But it came with a price. Laws contrary to the Word of God have been passed. For the first time, we had a president who was against the nation of Israel, treading into dangerous territory. Now, it’s important to give a leader time, right? After all, you can’t really look at their presidency to get a full picture until it’s all over. Our pastor says that “People will remember how you exit more than they remember how you enter.” Look at the end of 2016, when President Obama promoted a U.S. abstention that allowed the UN to demand that Israel end settlement-building in their own land! If that doesn’t shock you, think about this: On President Obama’s last day in office as president, he handed over $221 million dollars to the Palestinians. Talk about the way someone exits. The slaps in Israel’s face are not okay. Many Americans still remember the ‘high’ that came to America when Obama’s charisma wooed the Hollywood elite, actors, and celebrities, though starting in 2017 and especially in 2018, Obama’s legacy will begin to unravel. God takes seriously how we treat the nation of Israel. God will not be mocked. In late 2016 before the U.S. Presidential election, Donald J. Trump announced that he planned to move the U.S. embassy from Tel Aviv back to Jerusalem if he became president. Currently, no nation in the world recognizes Jerusalem as Israel’s capital, save Israel itself. This is significant because the U.S. was the first nation to recognize Israel’s independence in 1948, as President Harry Truman issued his recognition on an airplane the day after Israel declared independence. We know from the Bible that God does bless those who bless Israel and God’s people. God also blesses nations who bless Israel (see Gen. 12:3). Now, I don’t believe that news stories create Bible prophecy, meaning, I don’t fish for news and then turn it into prophecy to try and fit a jumbled hypotheses – that’s not a sound hermeneutic. However, it is important to notice the news when it does reflect what’s already mentioned in scripture and when things going on in the world actually do fit the biblical patterns and prophetic cycles. The election of President Trump in 2016 signified a turning point in the United States for the better. To those Christians reading this, pay attention to what God does with the nation of Israel in 2018. Why is 2018 important? Well, it is exactly 70 years from when Israel became a nation. 70 is the biblical number for perfection. There were 70 elders appointed by Moses (Num. 11:16). Israel spent 70 years in captivity in Babylon (Jer. 29:10). The number 70 is connected with Jerusalem, in that the city kept 70 years of Sabbaths while Judah was in Babylonian captivity )see Jer. 25:11). Also, a cycle of 70 7’s (seventy sevens – 490 years) were determined upon Jerusalem for it to complete its transgressions, in order to make an end for sins and for everlasting righteousness to enter into it (Dan. 9:24). Terah, Abraham’s father was 70 when he had his first male child. Cainan (a biblical patriarch) had his first son at age 70. The Hebrew people had a total of 70 Israelites that started a nation within a nation (while they were in Egypt) and they grew to over 2 million people by the time of the Exodus. President Trump turned exactly 70 years, 7 months, and 7 days old on his Inauguration Day on January 20, 2017. This is significant, as we are entering a bracketed period of Rest in the United States. This rest is a specific rest for Christians, as the year 2017 is the year 5777 on the Jewish calendar. Hebrew letters have word meanings, similar to Greek. This is known as Geomatria. An example of this is found in Revelation, when the number of the beast is referred to as ‘666.’ In the Greek text, it doesn’t say 666, it lists the 3 Greek letters that represent those number values. The year 5777 is a year that Christians need to be watchful and careful for what they say. It’s a year of “Light”, as the meaning of 5777 promotes. On the Jewish calendar, we entered the year 5778 in late September 2017. The year 5778 is a year for tremendous growth and breakthrough. Just watch. Recently, President Trump announced to the Palestinian Prime Minister Abbas and King Abdullah II of Jordan that he will declare Jerusalem the capital city of Israel. According to the NY Times, President Trump “is expected to sign a national security waiver that would authorize the administration to keep [the U.S. Embassy] in Tel Aviv for an additional six months.” see here This is significant. Why? 2017 is not the year for Jerusalem to be recognized. 2018 is. This is the Jewish year of 5778. A waiver to keep it in Tel Aviv for another 6 months would place the date in next year, exactly 70 years from 1948, when Israel was recognized. President Donald Trump is in office for “such a time as this,” and is anointed for this task. Anointing in of itself does not designate that one is saved. It means that someone is called to a specific task that is pre-ordained of God. God called Nebuchadnezzar ‘My servant’ and King Cyrus “my anointed.” These were pagan kings, yet they fulfilled their purposes in Bible prophecy. Had the 2016 election gone the other way, many passive, leftist, and casual ‘Christians’ do not realize that America would have had another 30-40 years of heavy Leftist/Progressive laws against Christians and biblical principles in this nation, via the Supreme Court. To be bold, as long as President Trump is in office as the U.S. President, we do have an “open window” of opportunity. God has given Christians another opportunity to stand for the Truth. Let it be known that we are not to look to a president or any other man as our hero or savior, however, we can and must understand that God is still on the move in the world and He uses people to bring forth His promises in order to fulfill His prophecies. This window of opportunity will not last long. It will be for a few years; however, we need to be paying attention. It’s in windows of opportunities that revivals and awakenings occur. Think about what happened in the U.S. after Israel became a nation in 1948? You had healing revivals pouring out all over the United States, especially in the South with Oral Roberts, A.A. Allen, Billy Graham, etc. Do not expect nations to be rallying in support of the U.S. decision to move their embassy to Jerusalem. A high majority will be against the move. But they are not on the right side of history. The news media complains that such a move will be detrimental to the Middle East Peace process. No, it will actually kick things into gear and prepare us for the Battle of Gog and Magog (Ezekiel 38 and 39 – still down the road) which happens prior to the Great Tribulation. If we diligently read the Bible, we as Christians know how this is going to pan out. Jerusalem does not rightfully belong to the Palestinian Authority, it belongs to Israel. The West Bank territory is the ancient ‘high places’ of the Bible, where Jericho, Bethel, Bethlehem and ancient Judea is located. It belongs to the Jews. Besides, Jerusalem will need to be united, as the Palestinians currently hold East Jerusalem. Pay attention to when Jerusalem unites as one city under the Israeli flag. 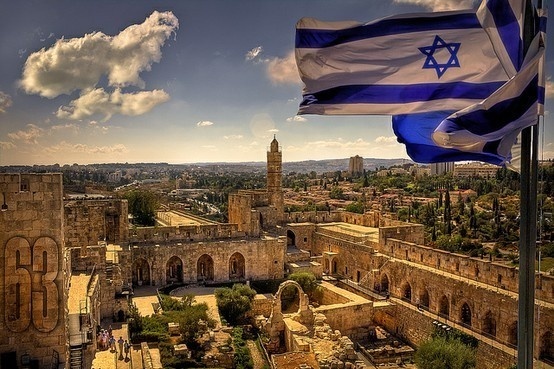 As Jerusalem will soon be restored as Israel’s capital city, keep in mind that a revival and awakening will follow it. It’s only a matter of time. President Trump seems like an ‘extreme’ for many Christians, but the truth is, when someone extreme comes in to make a mess (President Obama), you need an extreme clean up. This is why the election went the way it did. Many Christians don’t realize that it was actually evangelical voters, especially the Amish and Mennonite communities that swung the State of Pennsylvania for President Trump. Marco Rubio, Jeb Bush, Ted Cruz, and Ben Carson would not have been able to have the rigor, authority, and consistent discipline needed to help turn this nation around. We needed a man who was bold, shrewd, wise, and yes, brazen. It was always interesting for me to hear that there were so many Christians who were so confused as to which side of the aisle’s candidate to vote for. If we look to biblical principles and see how a nation’s laws that are passed can either bring or destroy God’s favor/blessing on our nation, we need to really look at what they stand for. When you boil it down, it’s not difficult to ascertain the answer to the past confusion. Also, pay attention to Vice President Mike Pence. Keep in mind that the the President’s Evangelical Advisory Board had a lot of influence in President Trump’s campaign. From an source I know, Melania told her husband back in 2015 as they sat in front of the television one night, watching what was going on in the nation: Now is the time. If you run a campaign now, you will win. A high-up, national leader surrounding himself with strong Christians is something to pay attention to. Especially when the name of Jesus Christ was invoked several times by Christian ministers and pastors at the Inauguration in Washington earlier this year. Brothers and sisters in the Lord, we must link arms in the faith. Our common Faith in the Lord is thicker than politics. Let us not be divided by politics. Let us look to the Word of God and let His Word be revealed to us so we can truly understand what is going on in the world around us that so desperately needs the Truth. Truth comes in and through Jesus Christ alone. When we know the Truth, it is the Truth that sets us free. Thank you for your comment, Robert. I appreciate your feedback, and blessings to you!